When venturing to the Ethnologisches Museum on October 20th, many of the students in Laura Scuriatti’s Museums, Literature and Collections class were in the midst of writing midterm papers due that evening. As the group was waiting for the tour to start and the stragglers to join the rest, you could find students sleeping on benches, leaning against postcard displays, and aimlessly flipping through picture books in the gift shop. That all changed when they took a trip to the South Seas. Free-lance tour guide Dr. Regina Knapp was a visiting anthropologist who focused on Papua New Guinea culture. Having spent her childhood growing up in Papua New Guinea (her parents were both teachers there), she has a deep care and concern for their culture. In fact, she had only just returned home from a research project in Papua New Guinea the day before. 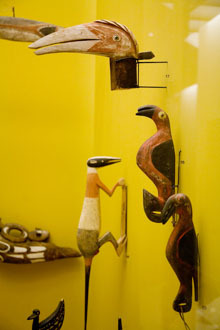 She began with giving the group some of her own context in relation to the museum and the cultures of the South Seas. The students quickly discovered that she was not the typical script-following tour guide when she had them sit on the replica of a boat that a security guard later “had kittens” over. It was not only her boldness in regarding artifacts as parts of an approachable source of inspection on other cultures, but also her boldness toward describing the flaws within a museum that provided a tour relevant to the interests of the class. The students had read in advance James Clifford’s essay “The Predicament of Culture” and were very interested in the way museums become heterotopias in regard to Michael Foucault’s Essay “Of Other Spaces.” This openness to critique of a museum created a dialogue between Dr. Knapp, the class, and the artifacts. Being walked through a culture behind glass with the help of a member and academic of that culture broke down a barrier and dissolved the falsehood of the museum supposedly representing every facet of a culture. The Ethnologisches Museum is a beautifully constructed example in the impossibilities of understanding a culture within the realms of ones own; however, this does not mean not to try. Visit the museum to peer into the circumstances of another society, but also ask why you are being shown these particular pieces of their life.